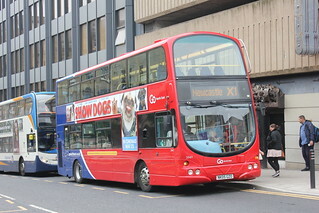 The entry into service of the Volvo B5LH/Wright Eclipse Gemini 2 vehicles at Percy Main on "Coaster" services 1/1A will allow the Scania CN230UB/Scania Omnicity vehicles currently allocated to these routes to be displaced elsewhere. 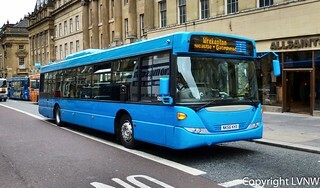 The majority are planned to be cascaded to "Blue Arrow" service 11, providing an upgraded allocation on this route and allowing the withdrawal of the branded Scania L94UB/Wright Solar allocation, while the others are being distributed among Percy Main, Stanley and Washington, for various purposes. This is one of the Scania CN230UB/Scania Omnicity vehicles which has been released for cascade to Stanley - it will replace Dennis Trident/Plaxton President 3889 (NK51 UCS) in the fleet at Stanley, which had previously been retained to cover for Scania CN230UB/Scania Omnicity 5248 (NK56 KHU) which had to be withdrawn having sustained fire damage. 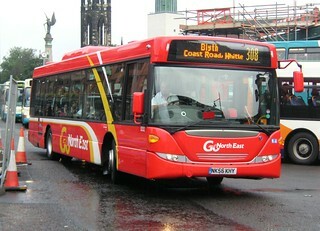 Ahead of the cascade of the former "Angel" branded Volvo B5LH/Wright Eclipse Gemini 2 vehicles to Percy Main; where they will be branded for and operate the "Coaster" 1/1A services, this vehicle has been repainted into Go North East's corporate livery. 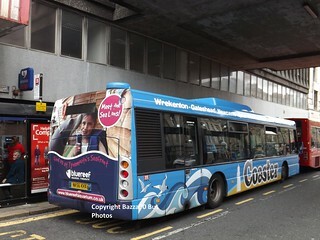 This example carries the tagline "Never miss your stop | Many of our buses have next stop screens and announcements"
As part of a project to upgrade "Coaster" service 1 (Wrekenton - Gateshead - Whitley Bay), this vehicle has been fitted with free customer Wi-Fi. This follows a recent deep clean on all of the "Coaster" branded vehicles at Thornton Brothers, Ashington. This vehicle has now lost its rear advertisement for the Bluereef Aquarium, Tynemouth. This vehicle has gained a rear advertisement to promote the Bluereef Aquarium, Tynemouth. 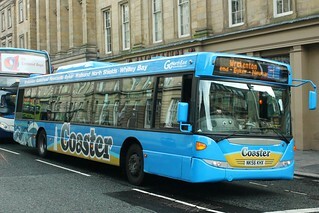 Coinciding with service changes effective 1st September 2013, this vehicle has received "Coaster" branding, with sub-branding for service 1 (Wrekenton - Whitley Bay). 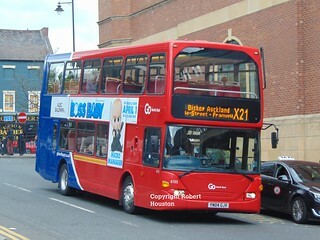 Following recent service changes which saw "Coaster" service 1 extend to Wrekenton via Low Fell and Harlow Green, replacing service 24 and providing customers on this route with a direct service to Newcastle, this vehicle has been repainted into a plain blue base livery. It is expected that the "Coaster" brand will be revised in line with the service changes, and the new brand design will focus on the coastal section of the route (Whitley Bay - North Shields). Following the entry into service of Mercedes Citaro vehicles at Percy Main on "Cobalt Clipper" services 309/310, this vehicle has been repainted into a plain cream base livery, for allocation to "Coaster" service 1 (receiving appropriate branding at a later date). 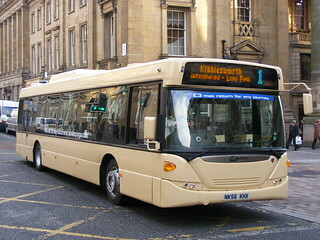 This vehicle has been repainted into a silver and blue base livery at Thornton Brothers, Ashington, and has also received "Cobalt Clipper" branding, with sub-branding for services 309/310. This vehicle has transferred from Stanley Depot to Percy Main, and presently retains the company's corporate livery. 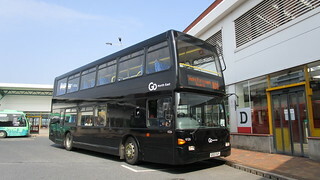 This vehicle, which carries Go North East's corporate livery, has entered service at Stanley Depot. When the vehicle is not required to cover for a branded vehicle on the "Red Kite" or "West Durham Swift" services, it should form the allocation of service 15 (Durham - Consett). Ahead of its entry into service, this vehicle has gained corporate livery logos. It is expected to act as a spare vehicle at Stanley Depot. 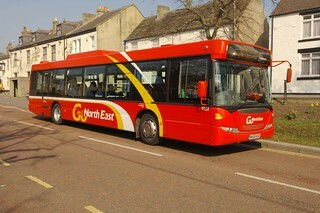 This vehicle, which carries a red base livery, has arrived into the Go North East fleet. It features high backed 'Civic V3' seating, and is currently being prepared for service at Saltmeadows Road Depot. Once prepared for service, it is expected that this vehicle will transfer to Stanley Depot. 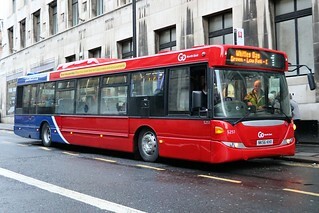 This vehicle has been repainted into Go North East's new corporate livery, having previously carried a plain red base livery. This example carries the tagline "It's our fantastic people - all 2000 of them - that make the wheels on our buses go round and round". Prior to new branding being launched, this vehicle has been repainted into a plain pink base livery. Following completion of preparation for service; this vehicle has returned to service at Riverside Depot, for use on the private Jewish Scholars contract, replacing the elderly step-entrance Volvo Olympian/Northern Counties Palatine 2 vehicles currently in this capacity at Riverside. This vehicle has transferred from Chester-le-Street Depot to Crook, on temporary loan, to alleviate vehicle shortages.